South Gallia senior C.J. Mayse (11) is double-teamed by Eastern defenders Mason Dishong and Sharp Facemyer (10) during the first half of Tuesday night’s TVC Hocking boys basketball contest in Mercerville, Ohio. Eastern junior Colton Reynolds (14) releases a shot over a trio of South Gallia defenders during the second half of Tuesday night’s TVC Hocking boys basketball contest in Mercerville, Ohio. MERCERVILLE, Ohio — Down to the wire … and then down to the wire again. 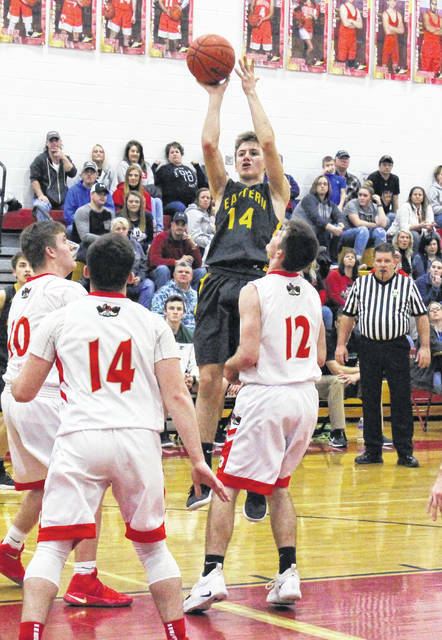 The Eastern boys basketball team rallied back from an eight-point fourth quarter deficit to force overtime, then took a permanent lead on two Garrett Barringer free throws with 3.6 seconds left in the extra session on Tuesday night while earning a 55-53 victory over host South Gallia in a Tri-Valley Conference Hocking Division matchup in Gallia County. 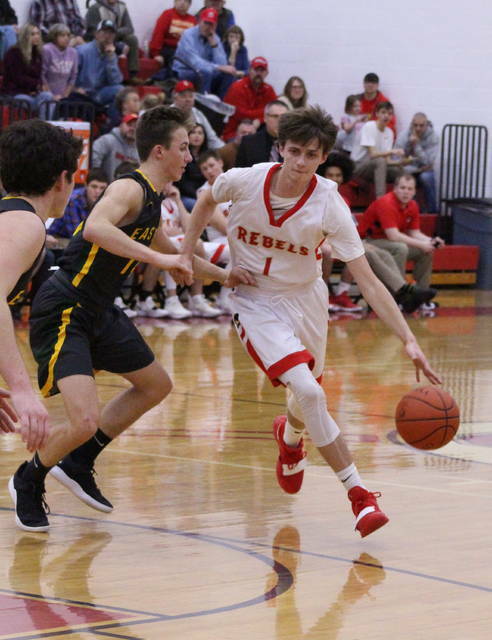 Both the Rebels (11-7, 6-6 TVC Hocking) and visiting Eagles (10-6, 7-4) battled through 13 ties and 10 lead changes over the course of 36 minutes, and neither squad led by more than two possessions through the opening three cantos. 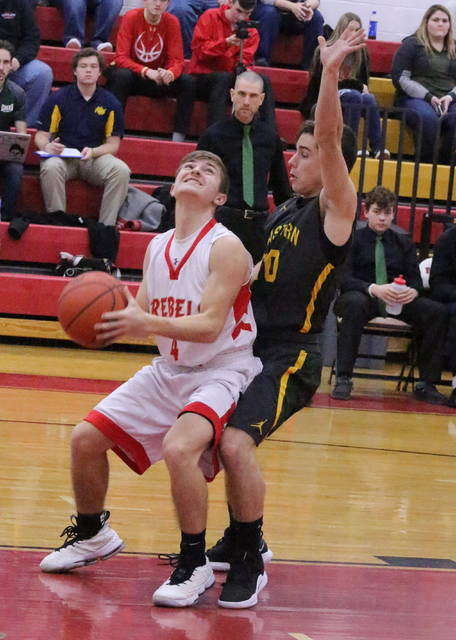 In the fourth quarter, however, the Red and Gold established a pair of eight-point cushions, the last of which came at 41-33 following two free throws from C.J. Mayse with 3:37 remaining. The Rebels went scoreless over the next three minutes, and the Green and White countered with 13 consecutive points that turned their largest deficit of the evening into their largest lead at 46-41 with just under 49 seconds left in regulation. Garrett Saunders ended the scoring drought with a basket 12 seconds later that cut the deficit down to a possession, then Braxton Hardy converted an old-fashioned 3-point play with 7.4 seconds remaining — tying the game at 46-all. Eastern ultimately turned the ball over on its final possession of the fourth quarter, and the Rebels did manage a three-quarters court heave that went over the backboard as the horn sounded. South Gallia made a quick 3-0 run in the extra session, but the guests answered with a 7-1 surge to turn their largest overtime deficit into a 53-50 edge with 44 seconds left. Nick Hicks tied the game up after burying a trifecta with 11 ticks remaining, and Eastern took a timeout after getting the ball across the timeline with 5.3 seconds left. The Green and White were able to send a direct inbounds pass from the sideline into Barringer on the low block, where he was almost immediately fouled. The sophomore calmly buried both charity tosses, allowing Eastern to take a timeout while scheming up a defensive plan with a 55-53 lead. South Gallia inbounded the ball from the baseline to the foul line, then tried to heave a pass down court to a streaking player in the right wing. The pass, however, was tipped and eventually stolen away by Colton Reynolds as time expired — allowing the Eagles to snap a three-game road losing skid. The Rebels were also 7-1 at home this season prior to Tuesday night’s outcome. Eastern, with the triumph, managed to claim a season sweep of SGHS after posting a 60-47 decision in Tuppers Plains back on Dec. 11, 2018. There were five ties and four lead changes alone in the first quarter as both teams were knotted at 14-all, but the Rebels reeled off six consecutive points to take the largest lead of the first half at 20-14 following a Hardy basket at the 5:18 mark. EHS — which never led in the second frame — produced six consecutive points to again tie things at 20-all with 3:01 left, but the hosts answered with a small 3-1 spurt that resulted in a 23-21 edge at the intermission. The Eagles went 5-of-9 from the floor in the third stanza, but the guests also committed six turnovers en route to a 10-all quarter. The Rebels, conversely, had only miscue and went 4-of-12 in the frame, resulting in a 33-31 lead headed into the finale. There were enough opportunities for either squad to win or lose this outcome, and things appeared at their worst for the Eagles after halftime — primarily in committing 11 of their 17 turnovers in the third and fourth frames while also falling behind by three possessions. But, as EHS coach David Kight noted afterwards, his troops responded to the adversity … and it was nice to finally come away with a favorable one-possession outcome on the road. SGHS coach Kent Wolfe was unavailable for comment following the game due to a developing headache. Eastern outrebounded the hosts by a 35-27 overall margin, but the Rebels posted an 11-9 edge on the offensive glass. South Gallia also committed 14 turnovers in the setback, with a quartet of those coming in the overtime frame. The Eagles netted 22-of-46 field goal attempts for 48 percent, but went 0-for-3 from behind the arc. The guests —who missed four consecutive free throw attempts in the final 30 seconds of the fourth quarter — were also 11-of-19 at the free throw line for 58 percent. Barringer paced the Green and White with a game-high 21 points, followed by Reynolds with 15 points and Blaise Facemyer with nine markers. Isaiah Fish and Mason Dishong were next with four points apiece, with Sharp Facemyer completing the winning tally with two points. Dishong led EHS with a game-high 11 rebounds and Blaise Facemyer was next with nine caroms. Barringer and Reynolds also grabbed six boards each. South Gallia was 18-of-52 from the field for 35 percent, including a 4-of-17 effort from behind the arc for 24 percent. The hosts also netted 13-of-21 charity tosses for 62 percent. Mayse led the Rebels with 15 points and eight rebounds, followed by Nick Hicks with 14 points and the duo of Hardy and Saunders with 11 markers apiece. Eli Ellis completed the Rebel total with two points. Saunders and Ellis also followed Mayse with six and five rebounds, respectively. 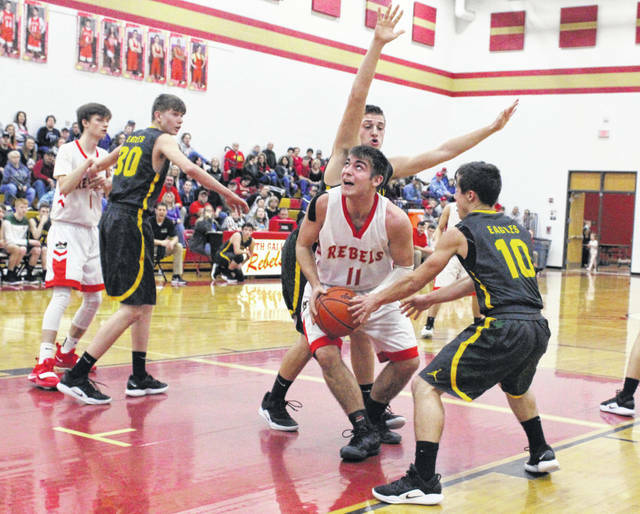 Eastern returns to action Friday when it hosts Belpre in a TVC Hocking contest at 6 p.m.
South Gallia travels to Federal Hocking on Friday for a TVC Hocking bout at 6 p.m.